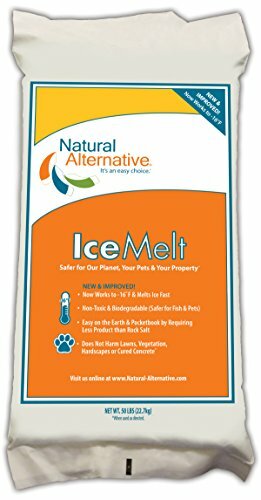 This ice melt has been independently tested and has shown not to harm fish or promote algae growth. It is listed with the Pacific Northwest Snowfighters Association (PNS) for reduced corrosion. One pound of this product is equivalent to three pounds of rock salt. Apply this product prior to a snow or ice storm for best results. As soon as it comes into contact with moisture, the product begins to form a brine to melt ice. The brine lowers the freezing point of the ground and effectively minimizes ice and snow accumulations, and thawing and refreezing. Safer for pets and does not harm vegetation or cured concrete when used as directed.